One of the venerable group of Venetian churches founded by St Magno in the 7th century, Santa Giustina was rebuilt in the 1500s by the Soranzo family, and given a new facade in white Istrian stone by Longhena that was completed in the 1640s. The church and adjacent convent had their greatest moment in the limelight because of a coincidence of dates: St Giustina's feast day, 7 October, just happened to coincide with Venice and christendom's victory over the Ottoman empire in the Battle of Lepanto in 1571. Beginning the following year, the Doge would make a special trip to attend a thanksgiving Mass. 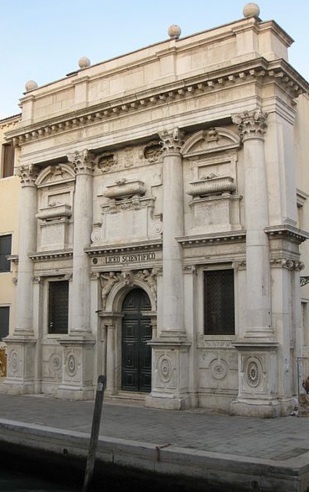 For all that, the church and convent were among the many suppressed by the Napoleonic regime in 1810; the church now houses the Liceo Scientifico Giambattista Benedetti and its altar has gone to Sant' Aponal.